gothere.sg is an amazing mapping service for Singapore that offers just about every service you might expect from Google Maps, including; public transport directions, driving directions, search for locations and local businesses, embeddable maps, mobile phone support, panoramic 'street view' images. There is even a taxi fare calculator that can work out the total time of a taxi journey, and an approximate fare based on time and location. 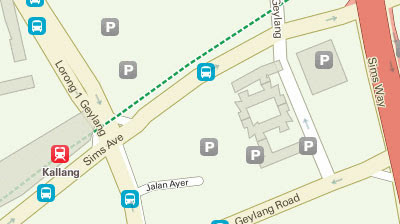 gothere.sg have even used their own maps. They have used the Google Maps API but have replaced the Google Map tiles with their own tiles. Which is good news for Sangaporeans as the gothere map tiles include a number of features missing from Google Map tiles of the island, such as public transportation stops and parking spaces. If you click on a public transport icon an information window will open telling you which lines you can catch from there. If you click on a parking icon, the opening times and costs are displayed. Obviously a huge amount of work has gone into providing this mapping service for Singapore and Google will have to work some to catch up in Singapore. SinGeo - SinGeo has a large and impressive list of Singapore Google Maps mash-ups.